VERY EARLY in the morning of 12 August this year, the Perseid meteor shower will do its annual star turn. Once again, my girlfriend and I will be watching the cold, cloudy, light-polluted, 21st century London skies, hoping to catch sight of some blink-and-you-miss it fiery trails. The Perseids this year will be of a stronger than usual ‘storm intensity’, with several hundred meteors hitting the atmosphere every hour. Regrettably, the shower will peak around dawn – this and a Full Moon on the night will probably mean our view of the Perseids will be rubbish. Nowadays we know what meteors are. But just over two hundred years ago, meteors vexed the great minds of Europe. “Meteor” means literally “something in the air,” and the prevailing explanation for them was that they were the result of an “accretion” of gases high in the atmosphere, that somehow congealed into solids. Volcanoes were also believed to cause meteorites, either by throwing out stones that rained down, or by expelling plumes of “effluvia” that congealed into rock somewhere in the atmosphere, possibly aided by electricity. Others thought meteors were terrestrial stones dumped by hurricanes, or even that the “magnetic effluvia” of the Northern Lights caused their formation. With the arrival of the Enlightenment and the Age of Reason, scientists had an increasing tendency to conclude that meteors existed only in the superstitious minds of peasants who had misidentified stones struck by lightning. The idea that meteorites were “cosmic bodies” falling from outer space was the least fashionable explanation. The meteorite mystery was solved mostly through the efforts of a man more interested in music and maths than cosmic astronomy. The father of meteorics (the study of meteorites) was an eccentric physicist called Ernst Chladni. His methods of investigation, and his lifestyle, were distinctly fortean. Like Charles Fort, Chladni spent way too much time in reference libraries. Like Fort, the evidence he amassed in support of his ideas on meteors came not form staring through telescopes or from analysing rocks, or from any expertise in his chosen subject, but from curiosity and through three weeks spent in a university library reading eyewitness reports. Chladni’s evidence was as likely to come from passages from Homer and from that proto-fortean favourite The Gentleman’s Magazine as it was from scientific journals. And in formulating his conclusions, Chladni relied not on his considerable – although informal and self-taught – grounding in science, but his training as a lawyer, to help him tell “fact” from “fairy tales” when evaluating witness testimony. Aristotle conceived a model of an orderly universe with celestial bodies moving in fixed, orderly ways in otherwise empty space. In the Aristotelian universe, there were no messy bits of rock rattling around or “small bodies beyond the moon” that could get in the way of the celestial bodies in empty space. It was impossible for stones to fall from the sky, as apart from the celestial bodies, there was no matter out there to fall. Aristotle suggested instead that meteors were the tops of exploding volcanoes blown into the sky. His explanation wasn’t well received by his contemporaries, but as the Aristotelian universe later became the cornerstone of Christian and Islamic cosmology, the volcanic origin of meteors gained more authority. Dr William Whiston’s An account of a surprizing Meteor seen in the air, March the 6th, 1715 at night, and his “Conjectures for the solution of the foregoing phenomena” was relatively mainstream for the time – he felt that meteors resulted when “exhalations and effluvia from the earth travelling above the ‘vapours’ become heavier than air and coagulate into stones in the Northern parts,” but ferment into thunder and lightning in the South. In fairness to the Age of Reason’s meteorite debunkers, an awful lot of superstition and folk tales fell from the sky. The large meteor that fell on Eisenstadt, Bavaria in 1492 was housed in the local church as an example of the “wrath of God,” while practically any stones that looked odd – from fossil shark’s teeth to prehistoric flint tools – were touted as “thunderstones” that had fallen during thunderstorms. The statue of the goddess Diana at Ephesus (probably carved from a meteorite - but see correction below) “fell from the sky,” as did the Lamean lion in the ten labours of Hercules (probably the fossil bones of a prehistoric mammal). The Council of Claremont in France, which proclaimed the First Crusade in 1095, was preceded by portents including an ominous shower of meteors. To the secular minds of the Enlightenment, all this was a red rag to a bull. The new brand of science required expensive kit to measure natural phenomena, and observers trained to use this equipment. Peasants and other “unlettered observers” who reported stones falling from the sky didn’t know what they were talking about, their worthless testimony belonged in the bygone world of witch-hunts and old wives’ tales. The 18th century was a time of exciting new discoveries. From the 1750s, scientists experimented with electricity. This exciting new science seemed to breathe new life into the atmospheric accretion model, with the electrical action of lightning in the upper atmosphere seen as somehow the key to the procreation of meteors. Mainstream science didn’t so much cling to ancient received wisdom, as get carried away trying to explain meteorites by linking them to sexiest new fields of scientific enquiry, gasses and electricity. One contemporary scientist was Antoine Laurent Lavoisier, who in his earlier career with France’s Académie Royale des Sciences gained a reputation as a tenacious superstition-buster. He demolished contemporary claims about water dowsing, and claims about a boy who could see water through strata of earth and rock. Lavoisier was part of the team called in to evaluate Franz Anton Mesmer’s claims around “animal magnetism”, for which he found no evidence. Lavoiser’s report on “a stone which it is claimed fell from the sky during a storm” was the first known chemical analysis of a piece of a meteorite, which fell in 1768 in Luce, France. He read his report to the Academy the following year, and it was written up in 1772. (2) Lavoisier, the junior partner in the committee that authored the report, found iron pyrites in the stone, and concluded that “thunder struck preferentially on pyritiferous rock,” which peasants had misidentified. He speculated that the iron pyrites in the rock somehow attracted lighting. On the subject of meteors, he added that "true physicists" had always been sceptical. Antoine Lavoisier's report on "a stone which it is claimed fell from the sky during a storm"
An electrical explanation for meteors has been tentatively suggested by the Academy’s Jean Baptiste Le Roy the previous year, in his report to an enquiry triggered by a fireball “more intense that the sun” streaking over Sussex and reaching an apparently impossibly high speed exploding over Melun, France. By 1789 a much more influential Lavoisier had published his paradigm-shattering Elements of Chemistry, which caused a steady stream of defections from the prevailing scientific model of “phlogiston” – a substance with a negative weight that was added during combustion – and replacing this with newly discovered gasses such as hydrogen and oxygen. Just as scientists were getting carried away with electricity, so Lavoisier was now changing his mind about meteors, seeking explanations for them in the exciting new world of gasses. He was now favouring an idea he had earlier rejected, that dust containing metals rose to inflammable layers of the upper atmosphere where it could be ignited by electricity to form meteors. In 1787 he discovered a way to make sound waves visible, by sprinkling fine powder on a metal plate and rubbing the edge of the plate with a violin bow. The vibrations caused the powder to form symmetrical patterns (still called “Chaldni figures”). He wrote this up in 1787 in Endectungen über die Theorie des Klages, which founded the discipline of acoustics. Chladni had a talent for what’s now called “science communication” – his sound wave patterns were visually beautiful, and he combined the science with entertainment and music, inventing and helping to build weird and wonderful instruments – the “clavicylinder”, a kind of glass harmonica harpsichord, and the glass rod-based “Euphon”. With a horse and carriage, he took his show on the road. In a day job familiar to many forteans, he made a living he described as a “nomadic, carefree existence” on the paid lecture circuit, sometimes with 14 gigs in a row in each town. Now scientifically respectable, Chladni was on tour in Göttingen in 1793 when he got into conversation with the elderly and frail Georg Cristoph Lichtenberg, one of Europe’s best-known physicists. Licthenberg told Chladni he’d seen a fireball exploding over the city on a November evening two years earlier. Chladni gave Licthenberg the credit for coming up with the idea that meteors may be “cosmic bodies” and that he should seek evidence in Philosophical Transactions. But having a brilliant idea is not the same as doing the unglamorous library work, as every fortean knows. Chladni spent the next three weeks in the Göttingen university library, where he found reports of 24 well-documented fireballs and 18 falls of iron or stone, and many less well-documented cases, including ten historical falls from the first century AD to the 17th century. Of these, the most impressive was the mysterious “Pallas iron”. This was a huge 700kg (1543 lb) lump of iron with holes like a Swiss cheese, found by German naturalist Baron Peter Simon von Pallas in Krasnoyarsk, Russia in 1772, and it was still well known when Chladni was researching. The Pallas iron was one of five “iron masses” Chladni knew of. Chladni found other reports of meteor falls: the recovery of stone fragments “40 or 50 English miles” apart at Blagdon, England, in 1783, and Jean Baptiste Le Roy’s report to the Academie Royale des Sciences on the 1771 Melun, France, fireball (see above). Prefiguring FT’s own “Classical Corner,” Chladni also found reports in Homer’s Odyssey and of the meteor fall on Roman Thrace from Pliny’s Natural Histories. 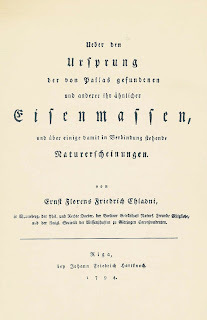 Chladni hesitated to publish Ueber den Ursprung, expecting a hostile reception, and he got it. Many scientists immediately dismissed the work because it relied on eyewitness accounts of a phenomenon Chladni has himself never observed, and his methods would still be unacceptable to the scientific establishment today. In later magazine articles, Chladni said people were telling him they believed him but they felt they couldn’t say so publicly. Even Lichtenberg criticised Chladni’s book at first, but eventually came round to his way of thinking. And while Chladni’s premise turned out to be correct, some of his ideas were bizarrely wrong, far more barking than the prevailing theories of the day. Chladni decided that some small meteors were “spongey masses” that ascended from the earth and caught fire, and that some falling meteors were tiny, but swelled up to enormous size when they hit the atmosphere, while others were made of ‘soft and elastic fluids’. By 1805 Chladni had decided all meteors came from lunar volcanoes, before changing his mind again. Two months after Chladni’s book appeared, supporting evidence literally fell out of the sky near Siena, Italy. A sparking and booming red cloud threw stones to the ground, some of which were recovered, and they had an identical chemical composition to other meteorites. The Siena fall was widely discussed, most reports blaming lunar volcanoes. While orthodox scientists may not yet have accepted Chladni’s views on meteor origins, his book had at least got them thinking about what evidence they needed to look for – a fall seen by a “trained observer.” A fall of meteors at l’Aigle, France in 1803 seemed to provide the confirmation the sceptics were holding out for. Young physicist Jean Baptiste Biot, dispatched by the ministry of the interior to investigate these meteor falls, followed a sound fortean principle, always ask the locals. His report was dated Year 11 of the Republic (1803) and it’s noticeable that all the eyewitnesses he interviewed are addressed as “Citoyen,” (Citizen.) In the new egalitarian France, the unlettered observers were no longer contemptible peons but citizens worthy of respect. Biot took the testimony of local Academy of Sciences member Leblond, but also interviewed farmers, an elderly widow and the concierge of the local castle, and their testimony carried equal weight. The atmospheric propagation of meteors theory lingered on until the 1860s. The idea that meteors were from lunar volcanoes didn’t finally die until the late 19th century. Two centuries later, science historians are divided on whether Chladni was more influential than the then obscure Biot, and on whether Chladni founded meteorics or just laid the groundwork for others to follow. 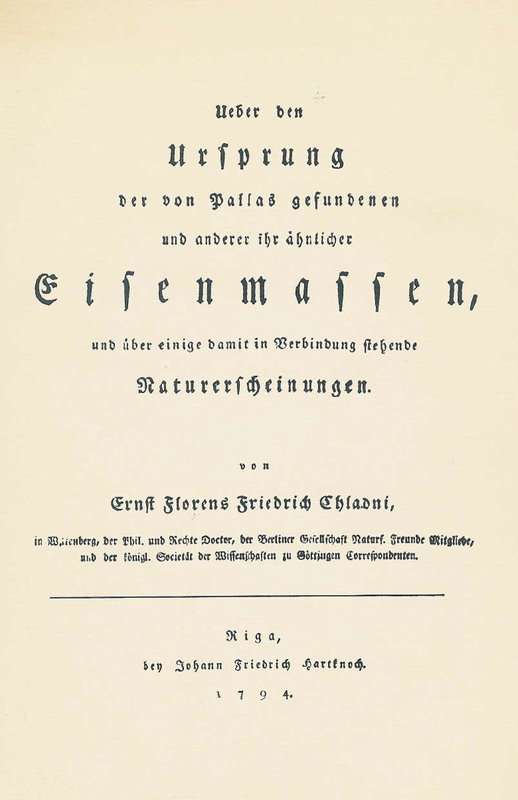 Chladni continued what he called his “somewhat nomadic way of living” on the paid lecture circuit, largely unaffected by the controversy around Ueber den Ursprung. He “never received and acceptable offer of a professorship.” On the back of his work on acoustics, his most lucrative lecturing gig was a private audience at the Tuileries palace in Paris in 1809, at which he demonstrated his “sound figures” to Napoleon and an impressed Biot and his fellow Academicians. Chladni mentioned Biot’s mission to l’Aigle in his 1819 meteor update Ueber Feuer-Meteore, (On Fiery Meteors), by which time he had discovered the Gentleman’s Magazine, citing its latest reports of Irish meteor falls. Fiery Meteors has a more extensive proto-fortean list of historical “falls that have been observed, in chronological order” and “distances they were observed to travel” – from Japan, 839 AD, “a stone or iron mass” reported in Alexandria in 1280, and so on. When the Napoleonic Wars came to Wittenberg, Chladni fled to nearby Kemberg, where he was based for the rest of his life, in a crowded one-room house/laboratory. Physicist Wilhelm Olbers said of an elderly Chladni in 1824, “it is truly sad that this, in many ways, deserving man has found no institution to award him a position with a salary.” Chladni died on yet another lecture tour in 1827. Only in 1950 was the origin of meteors in the asteroid belt conclusively proven, with fireballs being superheated ionising gases around the falling meteorite, and the thunderclap being the sonic boom from the shock wave of it hitting the atmosphere at high speed. Chladni cited several reports of a sinister hissing sound accompanying falling meteors, and we still don’t know exactly what this is. In recent years, the Ministry of Defence’s Project Condign report on Unidentified Aerial Phenomena in the UK (see Fortean Times 211:pp4-6, Fortean Times 212: p28, 250: p28) has revealed that government scientists take seriously the idea that superheated meteors may somehow interact with atmospheric gases to create exotic plasmas that are mistaken for flying saucers. Over 200 years after Chladni unravelled the origins of meteors, some meteor mysteries remain. In the event, the moon wasn’t a problem, but thick cloud and pouring rain meant we had to call off our Perseid-watching gig for 2010. I saw a few sudden movements in the sky above my garden early on the night of 12 August which could have been meteors. Another meteor mystery - Since this article first appeared in 2010, I went to a Natural History Museum event at which they let us handle meteors. I sneakily brought along a fridge magnet, which I touched against a large, sawn-in half iron-nickel meteorite to confirm for myself that they are magnetic. The geologist talking us through the meteorites in the NHM's Earth Sciences Galleries collection told me of another meteorite mystery - some iron meteorites seem to last forever after they've fallen, but some iron meteorites seem to rust away to nothing. While some meteorites are displayed as they are, without even needing a display case, and they let museum punters handle or even climb on them (the bigger ones, that is), others have to be kept in humidity and temperature-controlled cabinets to stop them disintegrating. And nobody knows why. 3) The composer George Frideric Handel had a similar upbringing. His father had a career in law planned for him until he (Handel senior) dad when George was 13, allowing him to take up music for the first time. 4) There is a widely-held belief, especially among “alternative science” enthusiasts, that Lavoisier (or in some versions of the story the French Academy of Sciences) induced all the museums of Europe to throw away their meteorites in 1790, and that is the reason that there are no meteorites collected from before this date in existence today, except the 1492 Ensisheim meteorite, which was too big to throw away. I have found no evidence from primary sources for any mass throw-out of meteorites. Chladni knew of at least five extant “irons” including one from 1751 in Croatia in the Imperial Natural History Cabinet in Vienna, which as the Vienna Natural History Museum stil holds numerous meteorites in its collection that date back to 1748. A piece of the Pallas iron, of 1772 vintage, is still in the Berlin Natural History Museum. Many collections appear to have started shortly after 1790. The story of the mass throw-out of meteorites may be a pre-internet urban legend. I have traced it back to the first page of Richard Milton’s Alternative Science (Fourth Estate, London, 1991), and Richard Milton told me he can no longer recall the source that he got it from – which is fair enough 18 years after he wrote it .I have not found any sources before 1968 mentioning the alleged mass meteor throw out, and Charles Fort made no mention of it in The Book of the Damned (1919). The resident meteor experts at Imperial College and University College London (UCL), the UK’s leading centres for the history of science, hadn’t heard of such an event either. Update (March 2013): Re: the belief among "alternative science" that Lavoisier ordered the destruction of Europe's metoer collections in the last years of the 18th century, a reader was kind enough to point me to an older source for this. Lindsay B. Yeates, a Ph D student at the University of New South Wales, referred to an article by Friedrich Adolf Paneth, F.R.S. (1887-1958) on "Science and Miracle", in the Durham University Journal (New Series), Vol.10, (1948-1949), pp.45-54. As a result of their reading of Lavoisier, claims Paneth "Scientists in other countries were anxious not be considered as backward compared with their famous colleagues in Paris. It is a sad reflection that in those days many public museums threw away whatever they possessed of these precious meteorites; it happened in Germany, Denmark, Switzerland, Italy and Austria. When in Vienna the well known mineralogist von Born was appointed curator of the imperial collectins he found a drawer labelled "Stones fallen from the sky" and highly amused, ordered them to be discarded, or at least degraded to the rank or ordinary minerals." Paneth cites an earlier source for the destruction of metoer collections at Vienna and other places - Die Meteorensammlung des naturhistorischen Hofmuseums als Born der Meteoritenkunden (Sitzber. Akad d. Wiss Wien 127, 715 1918 p. 719). 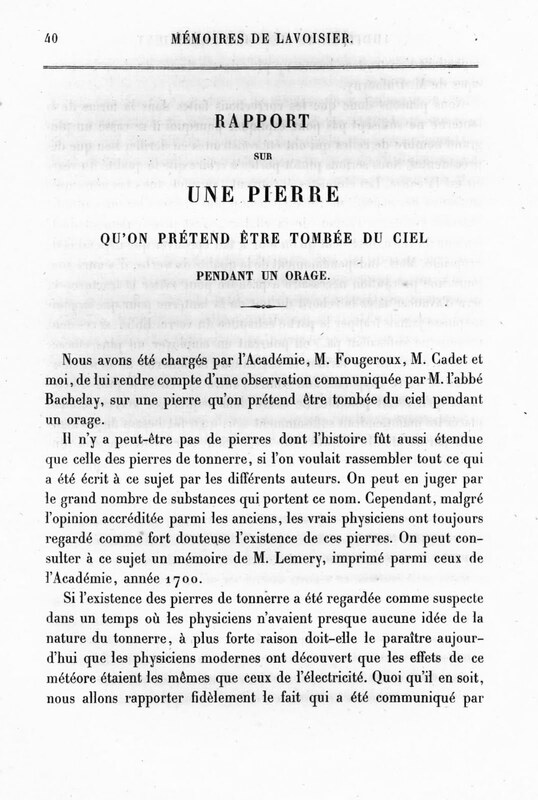 Lavoisier was the junior patrner reporting on the committee examing the stone that allegedly fell from the sky, and the appendix added by colleague on the Academy said that the phenomenon "requires further study". Lavoisier had changed his mind by 1790 (he decided that stones did fall from the sky, he just thought that they were made from gasses that accreted in the upper atmosphere). The Natural History Museum, Paris has a fragment from the Eisenstadt meteor of 1492, long pre-dating the supposed mass metoeor throw-out, although its catalogue online does not give its year of collection. A meteor in the collection at Vienna was, according to Paneth, saved from the bin as it was in the custody of the bishop, and was retained with a document bearing the imperial seal that forbade its destruction. 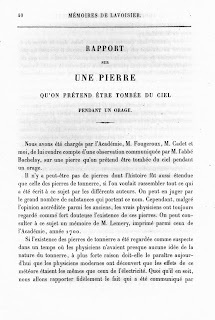 If museum curators were inspired to throw out meteorites by Lavoisier, it was from a later reading of Une Pied Qui On Pretend... after Lavoisier (still obscure at the time he wrote it) had been elevated to global importance, not as a result of anything Lavoisier said or wrote at the time of the alleged 1790s meteorite throw-out. A lot of the museum items then labelled as "stones that fell from the sky" could quite legitimately be binned or downgraded, as they obviously didn't stand up to examination, any inventory of the collection would have shown most of them were fossil shark's teeth or prehistoric arrowheads anyway. The "relegating to ordinary minerals" line cited by Paneth is in keeping with the metoer sceptics usual caveat that it "requires further study." Over the years this has become somewhat garbled in the retelling, so that by the late 1960s it had become something along the lines of, Lavoisier ordered all the museum collections of Europe to throw out their meteorites, and they mostly did. Mr Yeates also corrected my description of the statue of Diana at Ephesus "carved from a meteor," it was apparently "the thing that has fallen down from Zeus", completely untouched by human hands, was thought to not only resemble Diana, but to carry her likeness because it was an actual impression made on the object by Diana, and had then been thrown down by Zeus. The object features in in the New Testament's Acts 19:35. Why small countries do well at FCE?